Journey to the West (traditional Chinese: 西遊記; simplified Chinese: 西游记; pinyin: Xīyóujì; Wade-Giles: Hsiyu-chi) is one of the Four Great Classical Novels of Chinese literature. Originally published anonymously in the 1590s during the Ming Dynasty, and even though no direct evidence of its authorship survives, it has been ascribed to the scholar Wú Chéng'ēn since the 20th century. In western countries, the tale is also often known simply as Monkey. This was one title used for a popular, abridged translation by Arthur Waley. 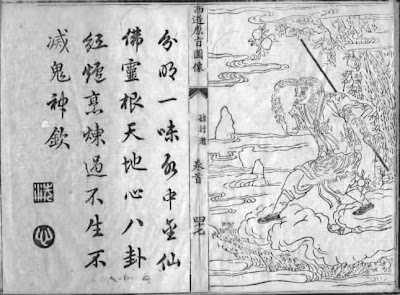 The Waley translation has also been published as Adventures of the Monkey God; and Monkey: [A] Folk Novel of China; and The Adventures of Monkey. The novel is a fictionalized account of the legends around the Buddhist monk Xuánzàng's pilgrimage to India during the Táng dynasty in order to obtain Buddhist religious texts called sutras. The Bodhisattva Guānyīn, on instruction from the Buddha, gives this task to the monk and his three protectors in the form of disciples — namely Sūn Wùkōng, Zhū Bājiè and Shā Wùjìng — together with a dragon prince who acts as Xuánzàng's horse mount. These four characters have agreed to help Xuánzàng as an atonement for past sins. Some scholars propose that the book satirises the effete Chinese government at the time. Journey to the West has a strong background in Chinese folk religion, Chinese mythology and value systems; the pantheon of Taoist immortals and Buddhist bodhisattvas is still reflective of Chinese folk religious beliefs today. 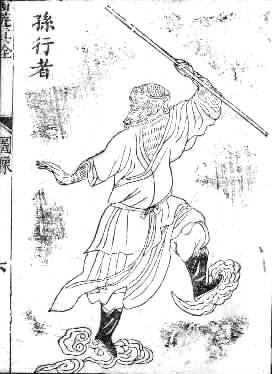 Sūn Wùkōng is the name given to this character by his teacher, Patriarch Subhuti, and means "the one who has Achieved the Perfect Comprehension of the Extinction of both Emptiness and non-Emptiness"; he is called Monkey King or simply Monkey Emperor in English. He was born out of a rock that had been dormant for ages in Flower Fruit Mountain that was inhabited/weathered by the sun and moon until a monkey sprang forth. He first distinguished himself by bravely entering the Cave of Water Curtains (pinyin:Shuǐlián-dòng) at the Mountains of Flowers and Fruits (Huāguǒ-shān); for this feat, his monkey tribe gave him the title of Měi-hóuwáng ("handsome monkey-king"). Later, he started making trouble in Heaven and defeated an army of 100,000 celestial soldiers, led by the Four Heavenly Kings, Erlang Shen, and Nezha. Eventually, the Jade Emperor appealed to Buddha, who subdued and trapped Wukong under a mountain. He was only saved when Xuanzang came by him on his pilgrimage and accepted him as a disciple. His primary weapon is the rúyì-jīngū-bàng ("will-following golden-banded staff"), which he can shrink down to the size of a needle and keep behind his ear, as well as expand it to gigantic proportions (hence the "will-following" part of the name). The staff, originally a pillar supporting the undersea palace of the East Sea Dragon King, weighs 13,500 pounds, which he pulled out of its support and swung with ease. The Dragon King, not wanting him to cause any trouble, also gave him a suit of golden armor. These gifts, combined with his devouring of the peaches of immortality and three jars of immortality pills while in Heaven, plus his ordeal in an eight-trigram furnace (which gave him a steel-hard body and fiery golden eyes), makes Wukong the strongest member by far of the pilgrimage. Besides these abilities, he can also pull hairs from his body and blow on them to transform them into whatever he wishes (usually clones of himself to gain a numerical advantage in battle). Although he has mastered seventy-two methods of transformations, it does not mean that he is restricted to seventy-two different forms. He can also do a jīndǒuyún ("cloud somersault"), enabling him to travel vast distances in a single leap. Wukong uses his talents to fight demons and play pranks. However, his behavior is checked by a band placed around his head by Guanyin, which cannot be removed by Wukong himself until the journey's end. Xuanzang can tighten this band by chanting the Tightening-Crown spell (taught to him by Guanyin) whenever he needs to chastise him. The spell is referred to by Xuanzang's disciples as the "Headache Sutra", and is as follows:- "Oh-munney pud-meyon", which is spoken quickly and repeatedly. Wukong's child-like playfulness is a huge contrast to his cunning mind. This, coupled with his acrobatic skills, makes him a likeable hero, though not necessarily a good role model. His antics present a lighter side in what proposes to be a long and dangerous trip into the unknown.